Life is a funny thing. It can change at a moments notice when you least expect it, it can continue on an even path, or it can be in constant flux. What many do not come to realise however, is that for the most part we are all in control of how things go. Imagine that you will that you are driving a car. If you are not sensitive to the responses the car is giving you about the road conditions you cannot be in total control. You are constantly active, with many micro corrections every second. Your foot is always ready at the brake, and always ready to deliver power when needed. Your hands are constantly feeling for the road surface through the steering wheel. Most drivers do not give it a second thought. Life is the same. You can coast out of control, or you can constantly adapt. Without life experience it is hard to know yourself. Without feeling the road of life you can miss out on so many things. With many people concentrating on their careers they often miss out on the very simplest of things that could make them feel more like a person and less like a drone. When I was younger I was very reticent to take up various activities such as watersports. I couldn’t get to grips with anything to do with water, yet I could see others having such a great time swimming or, as was drilled into every person of my age nearly every week on “Jim’ll Fix It” or “Blue Peter”, some smarmy so and so, usually with ten thousand Scout awards embroidered across their chest, having a great time in a kayak, and, shock horror, for some reason always being able to Eskimo roll the thing first time! Well, my subsequent experience of video production taught me that the latter was a lie and that there was always some, ahem, creative editing going on! Although that still didn’t change the fact that I was deathly afraid of the water. Experiences with sadistic school swimming teachers didn’t exactly help matters. As I became older I mellowed and became more insightful. In my late teens I took up a very individual martial art called Wing Chun. I say individual because it is nothing like any other martial art out there. It isn’t pretty to look at, but relies on efficiency of movement, directness, and infinite flow. There are deflections and shapes, but in actual use they are formless. It’s sole purpose is a single theory. Control over the opponents centre line of gravity while demolishing them. Not pretty, but practical. There is of course far more to it than that. However the important thing to remember is that the basis of Wing Chun is simplicity, directness, and efficiency of movement. There is a beauty to it once you are aware of it. So what in the hell has this got to do with kayaking? Well, I have been, and still am, obsessed with Wing Chun for the last 15 years or so. I think about it every day even when I am not physically practicing it. I enjoy the puzzle of the simplicity combined with the infinite depth. It is possible to over think it. As I have discovered this last week kayaking is very similar. It is a Wing Chun for moving a boat along the water! As it turns out, both Kayaking and Wing Chun are paradigms for life. Constantly active, searching for and reacting to movement, using basic structures as a basis to flow from one form to another in a seamless transition. Back in 2008 I decided to get over my fear of being under water. I took part in the Commando Challenge, an experience for which you can read about elsewhere on this very website. Suffice to say I proved something to myself. I could indeed go underwater, but I still had a yearning to do watersports. I still wanted to try the thing I had always wanted to. Kayaking. Kayaking without fear. In recent months I decided to take control. I was going to swim like everyone else, and no longer was I going to be afraid of the water. The Commando Challenge proved to me that I wasn’t anatomically different to anyone else and that I could go underwater without being dead. So I practiced everyday with being comfortable underwater to the point where not only do I not mind being underwater, but in fact I like it. To do this requires a lot of confidence to take things further, which for me meant finally enrolling on a kayaking course. I wanted to buy my own kayak, and I wanted to be able to use it properly, with confidence. While searching for local centres I stumbled upon a place called River Strokes. The website described a laid back yet professional approach to things, and stressed that the tuition was performed to cater for the individual with only small groups at any one time. When I rang I spoke to the owner of the centre, Daniel Povey. I was struck not only by his calm attitude, but also his honest advice. Much of my impression of kayak instruction before has been of a guy barking orders army style. This was a complete flip. I knew this was the teacher for me! I decided to enroll on the week long introduction to kayaking course. Usually this is a five day course, but due to the way things worked out Dan gave me the option of my fifth day being about support strokes and rolling technique. The latter being the big daddy of fear facing for me! More about that later. I rocked up at the River Strokes centre just before 9:30am on the Monday and was greeted by Dan. He struck me as being rather modest, given the places he has paddled. One thing is for sure, he is a very calm, methodical teacher, and he definitely knows what he is talking about. My first day was spent alongside a couple who had started the day before for a two day course. They had brought their own boats, which were very nice, new and shiny. I was also introduced to my steed for the week, a Bliss Stick Mac 1. This is important because the Mac 1 is a creeking boat designed to take on serious white water. It also makes a great learning boat because it will show up every flaw in technique! After a quick briefing we all got suited and booted and headed out to the River Wye at Glasbury. After getting onto the river we went through some basic strokes to warm up. Because I had joined my first day on the second day of another group I did have a baptism of fire so to speak. However Dan was always in control of the progression of things and separated my introduction very well. While I would practice what I had just been taught he would teach something to the other group. I was struck at how observant he was since he always kept a beady eye on my technique and corrected me when necessary. Not long after mid morning I got a shock. We were going to work on a capsize with a wet exit and swim to shore with the boat. A self rescue as it were. For me this was a big thing, and my adrenaline was pumping. This was to be my first experience of a capsize in a boat of any kind, and I was to be upside down underwater. I very conveniently allowed the other couple to go before me in performing this task first! “Ladies first” as I said to the other participants wife. You see, chivalry isn’t dead! Although nothing could change the fact that it was to be my turn afterwards. 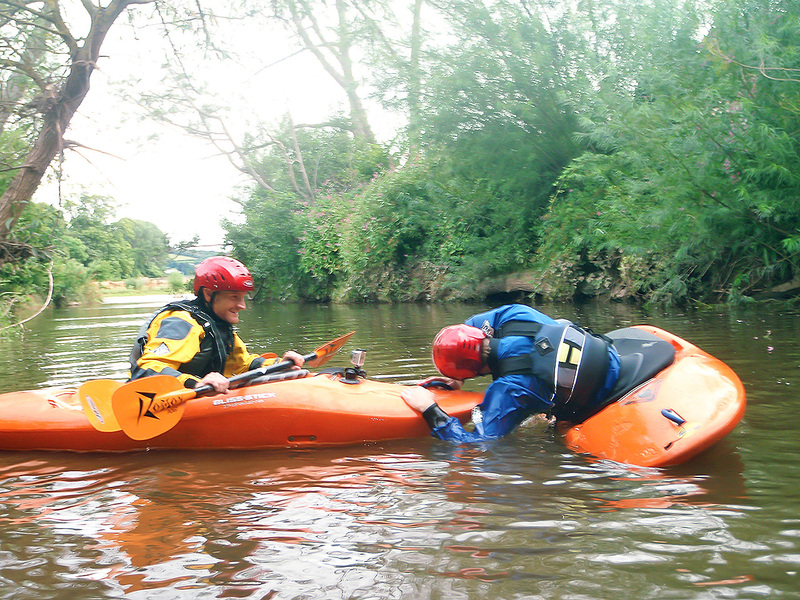 There I was, sat in my kayak next to Dan, who was expecting me to capsize the boat. He had given me a clear explanation of what to do and I knew that he was there if anything were to go wrong. I struggled to put my newly acquired nose clips on. Damn things kept slipping off. I made several excuses about this, half because it was true that they were slipping off, but the other half being that I was trying to delay the inevitable! Dan being the personality reader that he is gave me a few words of positive encouragement, but allowed me to take my time. Many other instructors would keep talking at this point, but Dan knows that the student has to find their own time first. I fumbled for a number of minutes trying in vain to psych myself up to capsize my boat. Then, after what was ooh, only around 10 hours or so I found my zone. I was going to go for it. I tried to capsize the boat, but it didn’t go. I made an excuse for which I can’t remember. I breathed a few more times and tried to psyche myself up again. Another 10 hours passed. Sod it, I capsized the boat! Grab the paddle, grab the boat. I start the swim to shore, amazed at how quick and simple it all was! Although being a new swimmer didn’t really help me with getting back to shore! To say I was useless would be an understatement! Luckily the Wye is quite low at this time of year and it only took me five hours or so before I reached a point at which I could stand up, drag the boat to the beach, drain it, and rejoin the group. That said, the experience was incredibly liberating. I’d hit one of my greatest fears in one great big sledge hammer attack. Me 1, Inner Voice 0, take that! I also discovered that I should really bring my newly acquired drytop for the following day rather than using the centre provided semi dry (or filled with water as it turned out) top. Oh, and top marks to my nose plugs for not allowing that lovely water up the nose effect. Even if they did fall off as I resurfaced. No rest for the wicked I rejoined for more basic paddling technique. Shortly afterwards was lunch. A very much needed break and a chance to dry off. Because it was the final day for the couple we spent the afternoon taking a 2 mile trip along the Wye, stopping to examine the various features for safety and lines that should be taken. We also briefly looked at moving in and out of eddies and ferrying across moving water. While this was advanced for me at this particular stage, it did give me a good taste of what was to come later in the week. After an early night I arrived at the River Strokes centre refreshed and ready to go for another day in the yak. Today was going to be a day of going through the basic strokes in much more detail. I would also be doing a capsize with the spraydeck on too, which would add another dimension to things. I had decided to bring my own dry cag today to give it a proper test! We started off warming up with basic paddling. Dan introduced me to the side draw and to sculling. Both of which took one hell of a lot of practice to get right! I was also shown techniques for slowing the boat down and the stern rudder, a way of steering the boat using the paddle like a… rudder. Just like the previous day I had to run through the capsize drill again. This time with a spraydeck. This is something that I know makes many people nervous because the spraydeck requires a certain pull technique to come off. Dan talked me through what to do, and allowed me to roll the boat over in my own time. Today my nose clips decided that they were going to behave, so I didn’t have any excuses. It didn’t matter though because my first capsize the day before had reassured me that the move is actually quite fun to do, and not that stressful. Having said that though, I still had some trepidation before throwing the boat over. It isn’t something we would naturally want to do! I took the boat over and to my surprise managed to get the spraydeck off without a hitch. I floated to the surface again and regained my orientation. Now I just had to do that swim to shore again with the boat! Like the day before I pretty much ended up going backwards! More work needed on my boat rescue swimming technique methinks! Although my swim to shore was a tad on the slow side, I did at least discover that my drytop kept most of the water out, despite an extended amount of time in the water. On the other hand I wouldn’t have expected anything less considering that it was pretty much strangling me at the neck! Our afternoon was spent going through turning the boat, using edging and other directional changes. Highly important techniques, especially in moving water. I was also taught a low brace to help recover the boat from a potential capsize. Unfortunately I was feeling a bit green around the gills, which sapped my energy and concentration somewhat. Although I carried on as long as I could. During day 2 I had felt very nauseous. I don’t get sea sick usually. The only time I have in the past was once when I went sailing the day after a skinful the night before, and when I was using a camera on a speedboat chasing the Severn Bore. I concluded that my drytop was too tight at the neck. The problem was that I couldn’t find a sharp enough knife to cut the latex seal down. I decided to put up with it the next day, but I would have to find a way to sort it out by the end of the week. We spent the morning on day three going over the basic strokes again, but Dan also showed me some more about how to edge the boat and to control it while paddling in a circle. Edging turned out to be a very important skill. Possibly the most important of all, because if you can’t edge the boat the strong current in moving water will catch you out much more easily. I also spent a lot of time going over my side draw and side sculling strokes. When you see an experienced paddler controlling their boat it looks effortless, but once you start to try to do the same thing it becomes very apparent that there is a very high level of skill there! After a spot of lunch it was time to go out on the river and take another short trip using the river features. Dan gave me a choice of whether to do the capsize drill now or after lunch. I opted to do it immediately so I could take my problematic drytop off during the trip rather than faff around trying to take it off now. During this capsize Dan wanted me to give it a few seconds of being under the boat before I pulled the sprayskirt off. Rather than being scary, putting in this delay allows some composure before exiting the boat. Another swim to shore ensued, slightly better than the day before, but not much. At least my dry cag held out the water again, even though the air temperature when I got out was much colder than previously. We got paddling down river right away to get warmed up. Dan took me through in more detail the techniques of ferrying across moving water and entering and exiting eddies (calm areas of water caused by obstacles in the river). Edging and paddle position was important, as was the initial angle to take. If I didn’t edge properly when I cross the eddie lines the boat would lose stability and there was a risk of going over. The great thing is that entering and exiting eddies is great fun once you edge the boat correctly! Entering an eddie is like when you are kid skidding your bike to a halt, but in a boat. Dan also taught me a technique for exiting the eddie while using the paddle in one smooth motion on the inside of the turning direction. Moving down the different sections of the river allowed for the use of all the paddling skills I had been taught so far. Dan made me aware of the different obstacles to look for, also how the water was interacting with them, and indeed itself. As we made our way down I had that nausea feeling again, so I hopped out of the boat at the next beach and took my drytop off. Ahhh, MUCH better! Not only was I did I feel cooler, but after a while my nausea started to reduce. Dan took me through some more ferry gliding on slightly harder water, and had me controlling the boat across the waves to place my boat in a surfable wave. It took me a few attempts but when I did it it felt really rather cool! One thing that doing all of this made me appreciate is just how powerful water is. This was only grade 1, so I can fully appreciate how much skill and nerve kayakers must have when they take on the really powerful stuff. Just as a point of reference, when the Severn Bore starts to cover the sand banks in the lower reaches of the river it is usually only around ankle deep, but it would take a person clean off their feet. 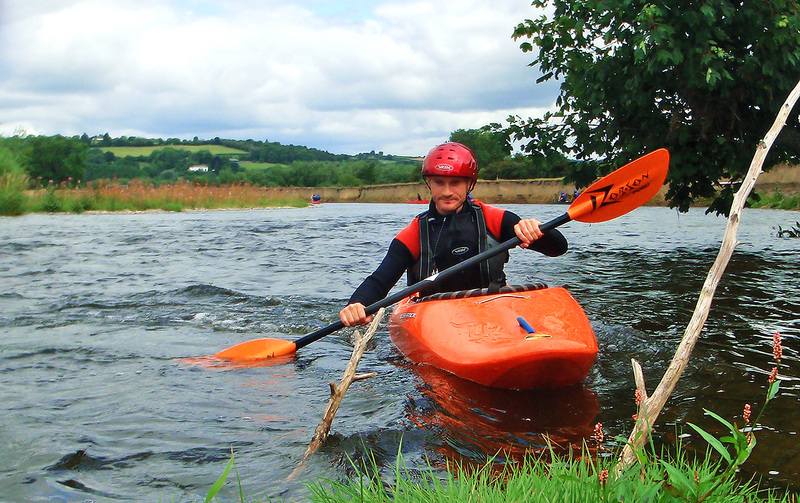 This was to be all about a 5 mile trip along the River Wye from Glasbury to Hay-On-Wye. The first two miles we had covered in previous days. However on this trip we were going to take in a few more features of the river on this stretch, and refine what I had been doing on the previous days. All aspects were played with, forward paddling technique, edging, ferry gliding, entering and exiting eddies with confidence and control, stern rudder, controlling speed to able to take more time to decide on lines to take, the whole shebang. Dan also took me through an exercise in what to do if I ended up heading sideways towards an obstacle such as a rock in moving water. The natural reaction would be to lean away from it, but in this instance I was told to lean into it. The reason being that leaning away from the obstacle makes it much easier for the current to grab the boat and turn it over. Leaning into the obstacle to grab it gives you more control and support when you go into it. The highlight of this particular day for me was on Hay Weir just before Hay-On-Wye. This is a small natural weir that offers a bit of a play spot. Dan got me to turn my kayak around and to ferry backwards down the small rapid that runs alongside it, then to ferry glide across into the surfable waves. 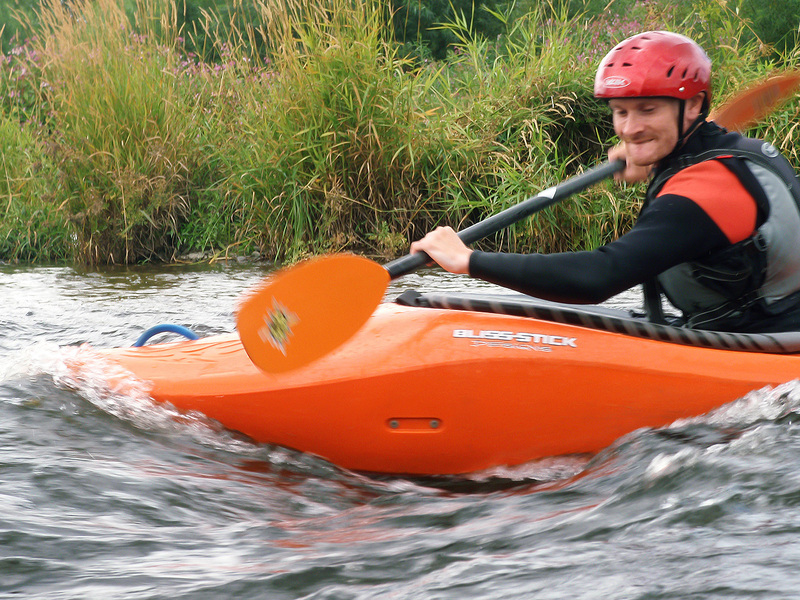 This was great fun, and a lot more challenging than before due to the much shallower, yet faster water. We spent a bit of time here as Dan explained micro eddies and how to use them to help make my way from the base of the rapid into the surfable wave again. Suffice to say that I didn’t manage it very well! There’s always next time. I did however carry my boat to the top of the rapid before paddling down it normally, putting into practice what Dan had said about keeping an active paddle. Day 5 – Rolling day! The big one! The day of reckoning. Usually the rolling day is a separate course from the introduction week, but because of the way schedules were worked out I was able to do this as part of my existing course. I was joined by three other would be victims, I mean students. 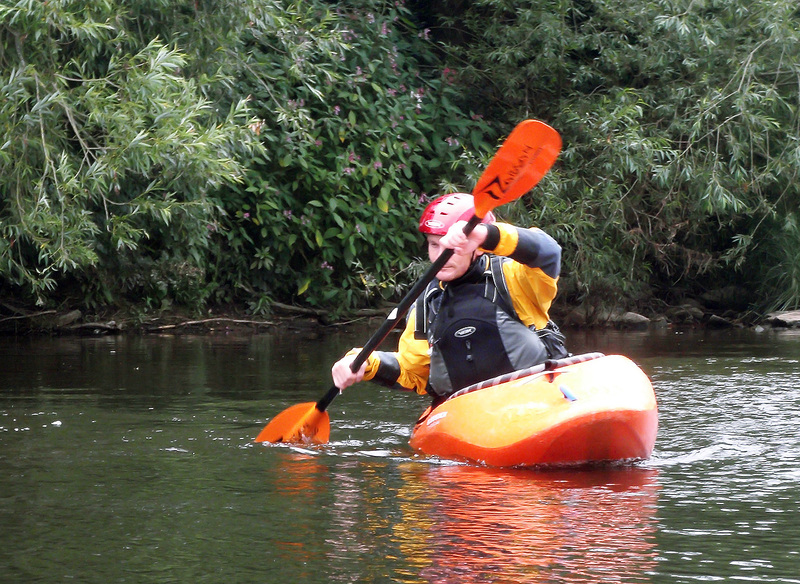 All had their own reasons for joining the course, though a running theme was the ability to gain confidence in the kayak. Rolling is not an easy skill, so a student is in no way guaranteed to be able to roll on their own at the end of the day. However all people who do this course will come away knowing more about the capabilities of the kayak, and indeed themselves. Dan breaks the rolling day down into stages. The first part of the day was spent working on stable forward paddling and stopping the boat. He explained to us the importance of keeping our weight forward for stability during maneuvering. We then went on to some edging practice to gain more confidence in the boat at an angle, as well as to practice control. This was followed up with some extensive tuition and practice of both high and low braces to help prevent potential capsizes. While the low brace is fairly straightforward, the practice of the high brace requires a lot of confidence. To practice it with any worthwhile results requires that the kayak is tipped right to the brink of going over. Preferably even to the point of slightly putting your head into the water. This turned out not only to be important for knowing whether what we were doing was going to be effective or not, but it also allowed the same control of the knees and hip, as well as the head that would be required for a successful roll. It was also confidence building because it became apparent just how far these boats can go before they finally tip over. Dan then moved us on to stage one of practicing the roll itself. We moved to a calm secluded stretch of water where we were told to partner up with one of the other paddlers. The idea was that the front of our partners boat would act as a support to hold onto with our hands. We then had to tip our own boat right over and then flip it back upright using only our knees and hips (no pulling up on the support boat). Once we had done this a few times and Dan was satisfied he moved it up a notch so that we had to do the same thing, but to submerge our heads as we tipped our boats over. As we practiced Dan upped the ante again and got us to hold ourselves underwater for at least ten seconds before flipping back upright. During this session my damn nausea came back again and I almost threw up. Nothing to do with the water quality, just my stupid body! After lunch followed by a break to settle the food we had just eaten we headed out on the river again to start the steps to performing a full roll. Dan broke this down into stages again and fully earned his keep by standing in the rather chilly and windy waters to support us and help right our boats when needed. First Dan had us perform a capsize in the roll setup position, and then righted the boat for us. We went through this a few times so that we could get used to where the paddle should be, and to find its angle ready for when we needed to roll up again. I had particular difficulty with this aspect as no matter which way I turned the paddle it ended up at a silly angle! Once we had become used to this stage Dan helped us with an assisted roll, taking us through the body positions needed, and an emphasis that it is the knees and hips that bring the boat back up, not the torso or head. They should be neutral and the head should come up last. Easier said than done! After Dan helped take us through the motions he let us try an unassisted roll. Lets just say that I kept making a right pigs ear of it! Dan was always there to bring me back up again though. He broke down the movements again, and I understood them, but getting my paddle blade angle right, and disengaging my none rolling knee was proving to be very hard. I don’t like being beaten by myself, especially because I am used to picking up physical movements and concepts very quickly! This one had me beaten though. My nausea kicked in again and I couldn’t do any more, but I was happy. I now had the basis from which to move forward with future roll tuition, and I now had a far better understanding of boat stability and recovery. Dan is an excellent teacher. Patient and calm, and with a lot of attention to detail. Given my trepidation with water I never once felt like I was being pushed to do something I wasn’t comfortable with. I have witnessed teachers elsewhere forcing students well out of their comfort zone, but with Dan this is not the case at all. He takes the time to understand how you learn. For example he picked up very quickly that I learned things better by actually doing things rather than reading from books etc. The centre is nicely set up, with warm changing rooms and transport to and from the river. Dan is also always on hand with a cup of tea or coffee at the beginning and end of each day! 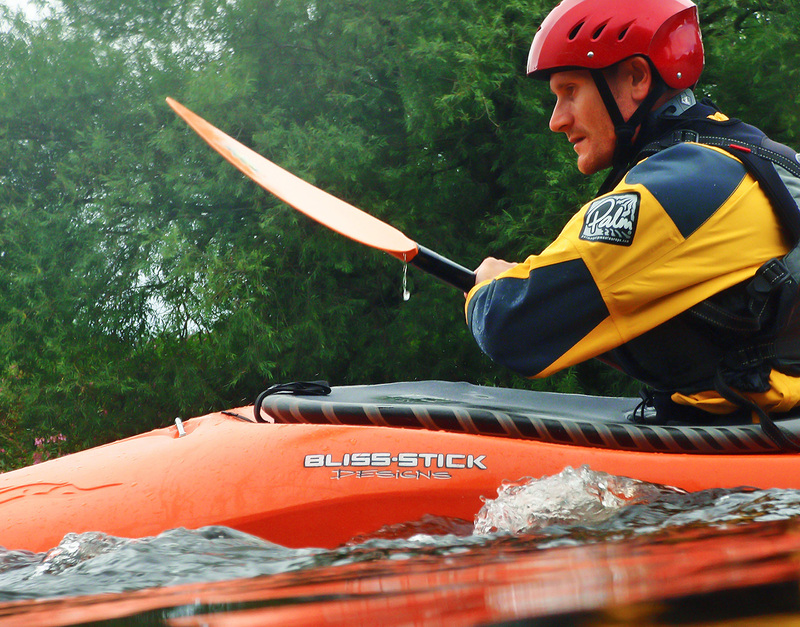 I thoroughly enjoyed my week at River Strokes and I will most certainly be booking myself on further courses. Highly recommended.